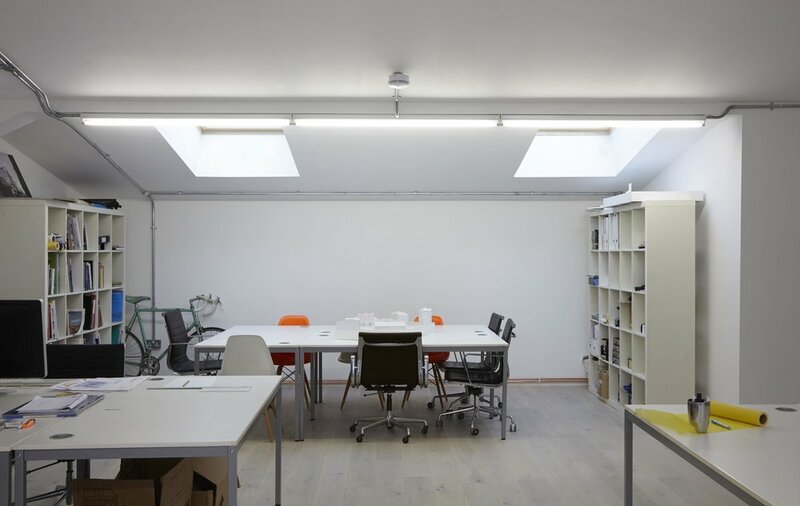 AKK Studios is a new four-storey studio building on Vyner Street for artists Kevin Francis Gray, Keith Coventry and Alireza Abrishamchi. The simple extension to and gutting of the former 2 storey warehouse building is expressed in two distinct elements. The new zinc clad volume of the top 2 floors alludes to the mansard attic space of the artists garret and provides a decisive contrast to the retained/recycled front facade of the lower 2 floors, which aims to maintain a trace of the historical character of the street. With a single studio space of equal floor area on each storey, the different internal front and rear elevational treatment were designed to suit the individual needs of each of the artists and in turn define the external building form. Fourth_space took the project from concept design stage through to completion on site and currently occupy the top floor office/studio space.